Dr. Anuscheh Farahat heads the new Emmy Noether Independent Junior Research Group at Goethe University Frankfurt. 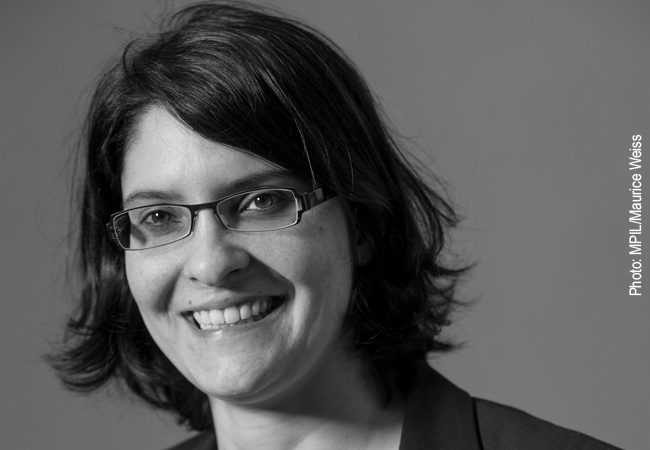 She is investigating the role of constitutional courts in European solidarity conflicts. A new Emmy Noether Independent Junior Research Group has started work at the Faculty of Law of Goethe University Frankfurt. The team headed by Dr. Anuscheh Farahat is dealing with the role played by constitutional courts in transnational solidarity conflicts. The global financial crisis has severely disadvantaged countries in the European Union too – and some of them have still not recovered today. To rescue the euro, the European Member States were obliged to get a grip on the debts of countries such as Greece, Spain or Portugal. This demanded and continues to demand a lot of transnational solidarity. However, coping with the crisis leads time and again to conflicts in creditor and debtor countries since it raises legal issues on both sides. For example, Germany’s Federal Constitutional Court had to clarify, amongst others, to what extent the Bundestag (the German parliament) is obliged to approve Germany’s participation in relief actions; after all, budget decisions are down to parliament. In Portugal, on the other hand, what were referred to as “Troika measures”, which foresaw sharp cutbacks in employees’ income, landed before the national constitutional court, which was asked to clarify whether measures such as salary and pension cuts in the civil service were consistent with the constitution. Are the courts the right institution to resolve such questions? Or might it not be the responsibility of a European-level entity or the parliaments? Or how else could the national courts be persuaded to take the perspective of other affected countries into account in their decisions? It is questions such as these which are being tackled by the new Emmy Noether research project “Transnational Solidarity Conflicts: Constitutional Courts as Fora for and Players in Conflict Resolution” that started recently. Project leader Dr. Anuscheh Farahat is convinced: “The crisis in the EU is in actual fact a crisis of transnational solidarity.” That is why she is investigating distribution and recognition conflicts in her project, which have become exacerbated in the EU during the course of the economic and financial crisis. Her work centres on what role national and European constitutional courts have played in these conflicts. How was the destructive potential of these conflicts institutionally channelled? Could new social order be brought about in the process? Or are other structures needed? The Emmy Noether Independent Junior Research Group, which is made up of three early career researchers, will receive € 900,000 in funding from the German Research Foundation, initially until February 2020. Project leader Anuscheh Farahat studied in Frankfurt, Paris and Berkeley and completed her doctoral degree in 2011 at Goethe University Frankfurt with a thesis on migration law that has been awarded numerous prizes. In 2014 she became Senior Research Fellow at the Max Planck Institute for Comparative Public Law and International Law in Heidelberg. Her research interests are European and German constitutional law, German and international migration law as well as comparative constitutional law. A main focus of her current research work is questions related to the organization of public authority in transnational judicial areas.